The Nugget on Coker unique cabin is located on a lovely creek in a small valley with a few other cabins. The location is very quiet and peaceful. The sounds of the creek, the breeze in the trees and birdsong are the greatest noise. Every detail in the newly refurbished cabin has been addressed to give you a comfortable, memorable visit. Local artisans designed and built the fireplace, gazebo and wrought iron stair railing. The new kitchen features a gas cooktop, electric oven, microwave, dishwasher, and refrigerator with icemaker. The first floor has an open floor plan with kitchen, living room and dining in one section. The game room and downstairs bath are in a second area. The Nugget is not a pet friendly property. Coker Creek is in the Cherokee National Forest with of many opportunities for outdoor activities -- hiking, biking, whitewater rafting, fly fishing -- and yet is within driving distance of the Great Smoky mountains and Pigeon Forge shopping and entertainment as well as scenic rides by car and rail. Near Championship Golf Courses: Tellico Villlage has three championship golf courses. For a limited time, the village is inviting non-residents to play its private championship courses. The Links at Kahite is a true 'links' course that meanders through a beautiful natuaral setting and offers spectical panoramic view of the Great Smoky Mountains. The Tanasi course has six sets of tees that play from 6,731 to 5,044 yards. The course borders Tellico lake and offers a diversity of appeal from the challenging water holes to the strategic par fives. The Tanasi Clubhouse includes an excellent restaurant that offers casual dining in a beautiful setting. The Toqua course features a classic design that is considered one of the best golf tracks in Tennessee. The course was built into an exquisite natural setting with several holes playing alongside Tellico Lake. Toqua is as challenging as it is beautiful and holes seven through nine may be the most demanding three consecutive holes in the state. Ocoee River - Olympic White Water Course: In 1996 the Ocoee river was the site of the World's first Olympic whitewater event on a natural river. The river is in a beautiful rocky gorge with Class III & IV rapids. Kayakers are seen on the river year round and rafting outfitters offer trips June-September. The White water center has a one-mile hiking trail which crosses a 330 foot suspension bridge and circles the center. The trail is entirely accessible for those who are physically challenged. There are an additional 20 miles of trails for hikers and mountain bikers, including the Bear Paw Trail and the Chestnut Mountain Trail, both of which are loops. A recent addition, the Thunder Rock Express, has received a lot of positive comments from bikers.The Old Copper Road Historic Trail allows hikers and bikers an easier paced adventure along the restored path that was used to transport copper by wagon from Ducktown to Cleveland before the arrival of the railroad from Blue Ridge. Fly Fishing - Tellico River and Citico Creek: The Tellico River and surrounding area make up one of Tennessee's classic trout-fishing destinations. The Tellico is best known for heavy stockings and big-fish potential on the main river and on Citico Creek. The Tellico is a big river, offering plenty of room for plenty of fishermen, and the heavily stocked section is more than 13 miles long. Tthe forks of Citico Creek and the Bald River, a major tributary of the Tellico, form the centerpieces of the Citico and Bald River wilderness areas. These streams offer wild trout in unspoiled wilderness settings and, more often than not, no company from other anglers. Guides and outfitters are available and the Cherohala Welcome center provides maps and a wealth of information. I am a retired electrical engineer. I grew up in East Tennessee and love the scenery and mountains of the area. After retirement, I decided renovating a mountain cabin would be a great project! For me John Muir's quote 'The mountains are calling and I must go' is a perfect fit. The creek is the focal point of this property and the reason I love it. The first floor bath is roomy and wheelchair accessible. Coker Creek runs across the back of the property and is visible from both decks of the cabin. Primary heating is a heat pump. The fireplace provides back-up heat. Bath and kitchen towels and bedding provided. The refrigerator is standard size with freezer and icemaker. The kitchen is newly renovated with new cabinets and appliances. The cook top is gas. Refrigerator has icemaker. Coffee maker, microwave and toaster oven. Indoor dinner table seats six. Outdoor table seats 4. New LCD TV - DirecTV satelite with enhanced channel package. Indoor toys including board games and air hockey are provided. Fishing poles, croquet and badminton provided. 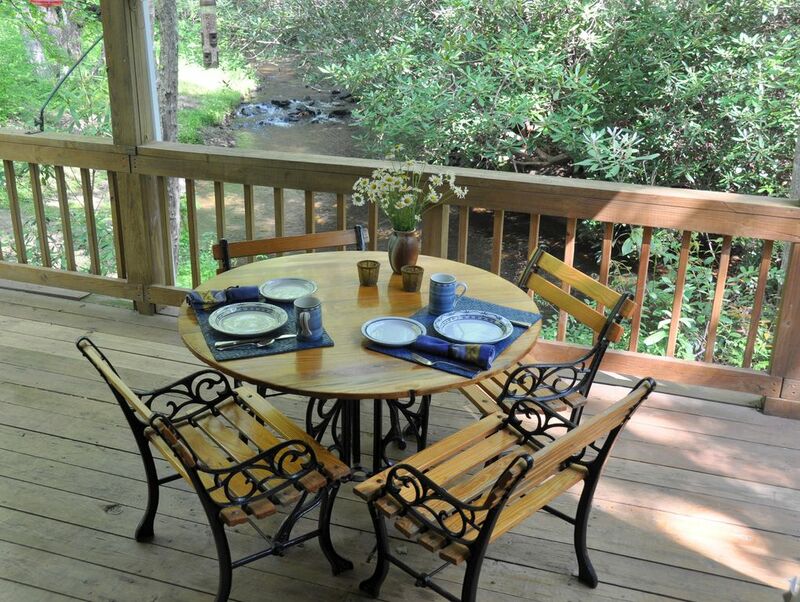 The deck is off the main floor of the cabin overlooking the creek. The table has park-bench seating. The deck is covered. The ramp provides a gradual ascent from the parking area to the 1st floor deck and gazebo. You can roll your luggage to the door. The hot tub is in the gazebo overlooking the creek with a huge bank of flowering rhodendron and the forest beyond. Privacy screen attached. The TV is LCD high definition. A DSL Internet connection is provided with WiFi access. A ramp is included in the decking to provide wheelchair access to the first floor, lower deck and hot tub. The first floor bath is wheelchair accessible. The first floor bed is a very comfortable queen sleeper sofa with an Air-dream mattress . The sleeper sofa is in the gathering area. The bedrooms are on the second floor. The grill on the lower deck is a large Weber propane grill. A very warm & comfy, well maintained cabin. We will definitely tell our friends and will be back soon. My family loved this place! Has everything you need and the setting is perfect. The creek, deck, hot tub, grill...I wouldn’t want anything else! Loved it. Perfect. Bud said. Another great time at a great cabin!!! The sweet little A frame cabin was exactly what we were looking for. It was great for our get-a-way with my 7 & 10 year old with grandma. We really enjoy cooking in for most of our meals and the kitchen had everything that we needed. Despite the cold, rainy weather the kids loved playing outside and the cozy living room fireplace was a great spot to end our nights snuggled watching a movie. The creek was a wonderful bonus. Loved this place! The Cherokee National Forest is a pristine forest with spectacular views, hiking trails, whitewater rafting on the Ocoee Olympic site, horseback riding, and fishing on the Tellico River and Coker Creek. A unique treat is panning for gold in the Cherokee National Forest. The forest is surrounded by historical areas and quaint towns that offer museums, antique shops, artists' galleries, and unique shops. The Cherohala Skyway and Tail of the Dragon route are popular with motor cyclists as well as those seeking mountain views. Other Activities: Panning for gold in the Cherokee National Forest is a popular outing; a guide to good sites is available at the Coker Creek Visitors Center. The forest is also a great place for hikes and mountain biking. Indian Boundary is a great family place with a lake and swimming beach and an easy hike.